You are famously the author of The Greatest Hoax: How the Global Warming Conspiracy Threatens Your Future, a title that was perhaps unintentionally ironic. The greatest hoax, as events have shown, has been your claim of a giant conspiracy. All of the evidence since has supported anthropogenic climate change. Last week even more data was published. 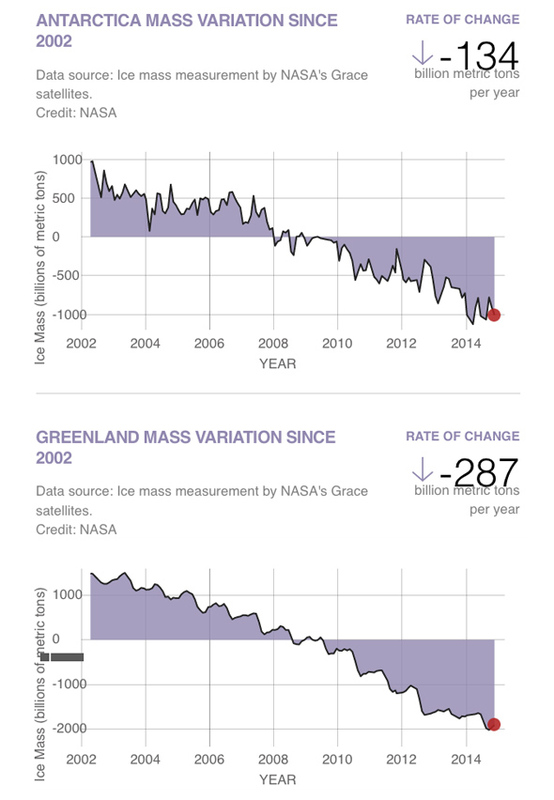 NASA revealed that data from the GRACE satellites launched in 2002 has shown that ice is melting from both Greenland and Antarctica at even faster rates than had been known. Ice that is on land isn’t in the water. Got that? So if it melts, it will raise the water level. Antarctica and Greenland have a lot of ice. Each year, snow falls in Antarctica and Greenland. Each year, ice melts. What matters is when more melts than accumulates. Because that means that the oceans are going to rise. And that means place at or near sea level are in danger. But let’s be more a little less hysterical and a little more “scientific.” You know, with “data.” Here are charts developed by NASA – you know, the federal agency – showing the net loss. And it is 421 billion metric tons of ice per year. Greenland is losing ice even faster than Antarctica (as climatologists predicted, by the way). Right now it is losing 287 billion metric tons of ice per year. In fact, since 2002, the two greatest ice sheets on the planet have lot more than FIVE TRILLION TONS of ice. More than 11 cubic miles of ice. That would cover the entire 70,000 square mile state of Oklahoma with about ten feet of ice. Yet you pretend this isn’t happening. You claim it is a hoax. You claim that scientists are boogering the data, that if the ice isn’t melting and that if it were that it’s not the result of the gigatons of CO2 that are the byproduct of Oklahoma’s largest industry: fossil fuels. You not only won’t connect the dots between the increased levels of CO2 in the atmosphere and melting ice; you deny that there are dots. Five Trillion Tons, Senator. That’s the mother of all dots. And anyone who has passed high school physics and isn’t dependent on the oil industry for their job can see the connections. In fact, in the interests of this year’s balance sheets for the fossil fuel industry you are significantly altering the climate of the entire planet. It’s utterly, criminally irresponsible. A buddy of WC’s turns his head aside and spits whenever he mentions Alaska’s last governor, Sean Parnell, by name. You grandchildren and great-grandchildren, Senator Inhofe, are gong to do the same thing.